I’d been itching to put wasabi in chocolate for some time, so when I found the wasabi/chocolate/ginger Black Pearl chocolate bars at Whole Foods, I bought two. At $5.99 a bar (3.5 oz) they weren’t cheap, but I was very curious to see how they’d work in wasabi brownies. 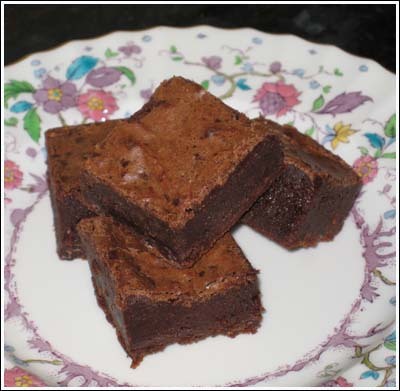 Vosges has a brownie recipe on their site, but I opted to use Nancy Baggett’s, which I’ve grown very fond of. All I did was sub 5 ounces of the wasabi/ginger chocolate for the bittersweet. For texture, I chopped up a little extra chocolate and added it at the end so that the brownies would have some chunks. The brownies were good and would be a creative ending to a Japanese themed meal. I’m still waiting to get a report from Todd’s office. It will be interesting to see if people say “Wow! Brownies with chocolate, ginger, and wasabi! How classy and exotic!” or if they’ll just take a bite and silently wonder if I cut the brownies with a knife I’d been using to chop ginger. Wasabi Brownies made by using Vosges Black Pearl bars instead of the usual bittersweet chocolate. Preheat the oven to 350 degrees. Line an 8 inch square pan with aluminum foil, letting the foil overhang two opposing sides of the pan by about 2 inches. Grease bottom of foil only. Combine the butter and chopped chocolate in a microwave-safe bowl. Microwave on high for 30 minutes and stir. Continue microwaving at 50% power and stirring every 30 seconds until chocolate is melted. Let cool to warm. In another bowl, thoroughly stir together the flour, cocoa powder and salt; set aside. In a mixing bowl, combine the sugar and brown sugar with the chocolate-butter mixture. Add the eggs and vanilla and stir until the sugar dissolves and the mixture is well blended and smooth. Stir in the flour mixture just until evenly incorporated. Put batter in pan and spread evenly spreading to the edges. Bake in the middle of the oven for 28-30 minutes, or until the center is almost firm when tapped and a toothpick inserted in the center comes out clean except for the bottom 1/4 inch, which should still look moist. Transfer the pan to a wire rack and let stand until the brownie is completely cooled. Refrigerate until well chilled. Lift from pan by grasping foil. Cut into squares. The wasabi was already in the chocolate, so I checked Vosges Chocolate site and it doesn’t say whether the wasabi is pure. The bars are $7.00 a piece, so it might be! Either way, the Vosges bar had a good balance. The only pure wasabi I’ve tasted is from Penzey’s. I love Penzey’s, but I found the pure wasabi too grassy/almost spinachy tasting. It improves as it sits, but I didn’t like it as much as the green stuff from a tube. that is standard in the US? I tried some fresh real wasabi from Oregon, http://www.freshwasabi.com, recently. It has a very subtle flavor that went well with the tuna I was serving, though it might be overpowered by good chocolate. Jen, can’t wait to hear your opinion. I have to say, these weren’t very spicy. No wasabi nose burns here.Julie, thanks for stopping by! Steph, that is Royal Worcestershire Bone China. You have a good eye. Jen, I think you’d like these based on your tastes.Amy, Todd told them what they were ahead of time so of course they liked them. What did Todd’s co-workers think? what an interesting combination of flavours. I would love to try this sometime. Those brownies sound great! Your plate is very pretty too. Hi,I love mixing chocolate with unexpected flavors. Wasabi is out there, but I think it could really work with the ginger. Nice site!